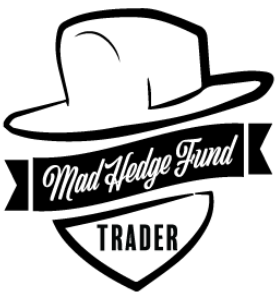 Meanwhile lets just say that we are proud The Mad Hedge Fund Trader contributed a whooping 28 entries. "I manage one million people, and managing people is like managing animals, and I don't like managing one million animals," said Terry Gou, CEO of Chinese manufacturer, Foxconn, where employee suicides have been rife. "Since 9-11, the government knows a lot more about you than you know about them, and the government likes that. But that's not what the American people want," said California Republican Congressman, Daryl Issa. In the words of United States Army General, Creighton Abrams, "When eating an elephant, take one bite at a time." "The factory of the future will have only two employees: a man and a dog. The man will be there to feed the dog. The dog will be there to keep the many from touching the equipment," said organizational consultant, Warren Bennis. "We may be moving from cautiousness to optimism, but euphoria is down the road," said Bob Doll of Nuveen Asset Management. "The rule of thumb is to do your homework, do your analysis, don't give up prudent risk management for the sake of certain fads. Look for real valuations, and stay true to your time frames," said Marc Chandler, the global head of currency strategy at Brown Brothers Harriman.